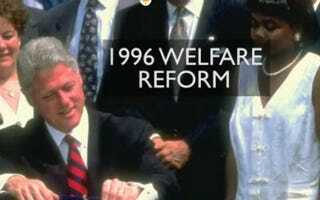 (The Root) — There continues to be vigorous debate between the Obama administration and supporters of the work mandate contained in sweeping welfare-reform legislation crafted in 1996 by then-House Speaker Newt Gingrich and signed into law by then-President Bill Clinton. The argument stems from the decision by the federal Department of Health and Human Services that it can grant waivers to states relating to the law's mandated work requirements for welfare recipients. President Barack Obama and his Health and Human Services secretary contend they are not weakening the mandate because the state governments have to show that granting the waiver will result in a 20 percent increase in the number of people going from welfare to work. That sounds good. It appears to give states greater flexibility. However, as with so many things in Washington, the devil is in the details — in this case, the Obama administration's definition of "work." Let's address those definitions in a moment. First, though, let's start with the intent of Congress at the time. A well-documented Heritage Foundation analysis lays out what the Congress said it meant when the bill was passed. In it, author Andrew Grossman writes that Congress intended that the work requirements "be absolutely mandatory in all instances and specifically withheld any authority to weaken or waive them." He says that "waiving the work requirements that are at the center of the 1996 welfare reform is not only terrible policy, but also a violation of the president's constitutional obligation to 'take care that the laws be faithfully executed.' "
At the heart of the argument over whether or not this new and unilateral administration policy weakens the law is Section 407 of the Social Security Act. Grossman notes this establishes "a stand-alone requirement for state welfare plans that brooks no exceptions, befitting its status as the core component of the 1996 reform. It is also absent from the list of requirements that may be waived under Section 1115. Indeed, to eliminate any possible ambiguity as to whether the work requirements could be waived immediately, a separate provision specifically states that waivers 'shall not affect the applicability of Section (407).' "
OK (still with me? ), so what about the previously referenced Section 1115? That section provides waiver authority for states to, in Grossman's analysis, establish demonstration projects, authorizing the feds to approve state programs that — and here's the rub — "test approaches and methods other than those set forth in Section 407, including different definitions of work activities and engagement." This definitional problem originated in the legal loopholes found in the 1996 law that led to some rather interesting ideas on what constituted "work." For instance "losing weight, exercising, getting a massage, reading motivational books and shopping with a friend" were all considered to be a form of work under the federal welfare regulations. So, in 2006, the Congress clarified the definition as part of the Deficit Reduction Act of 2005 (OK, I won't go there). But these revised regulations over time proved to be a burden on many states. Enter the Department of Health and Human Services, which, in a July 12, 2012, memorandum stated its intention "to test alternative and innovative strategies, policies, and procedures that are designed to improve employment outcomes for needy families," and therefore, using language in Section 402 of the law as their guide, the agency would exercise its Section 1115 waiver authority to ignore Section 407 and authorize states to adopt "different definitions of work activities and engagement, specified limitations, verification procedures and the calculation of participation rates." Given that last year the president said, "We're going to look every single day to figure out what we can do without Congress," this waiver policy quickly became one more example of the president's effort to expand executive power by picking and choosing which laws his administration will enforce (recall the president's decision to no longer enforce the Defense of Marriage Act?). His actions sparked an immediate war of words and accusations across the political spectrum. As the Atlantic noted: "To liberals — including, perhaps, then-state Sen. Barack Obama, who opposed federal welfare reform at the time — this is just what they feared welfare reform would do: make sorely needed government benefits less available to those who need them most. But to conservatives, the fact that fewer people are on welfare now proves that reform has worked." "The 1996 law was arguably the most successful policy change to help low-income Americans in the past 60 years," writes American Enterprise Institute President Arthur C. Brooks in the Wall Street Journal. "According to the U.S. government, welfare reform helped to move 4.7 million Americans from welfare dependency to self-sufficiency within three years of enactment. The overall federal welfare caseload declined by 54 percent between 1996 and 2004." Enter presidential candidate Gov. Mitt Romney, who hit back hard with a campaign ad accusing the president of effectively gutting welfare reform. The ad claims that under the rule, "you wouldn't have to work and wouldn't have to train for a job." The problem: The ad was quickly denounced as misleading by independent observers, including members of the Republican Party. "People who didn't know the details might be likely to believe it," said Ron Haskins, a Republican and onetime legislative aide who helped draft the original welfare law. But, as Haskins admits, "This could be a very effective thing for Romney to do." What? Distort the facts? Is this what we want from these candidates — a campaign erroneously claiming the president wants "to end welfare reform as we know it" (Romney) or inferring that Romney is responsible for the death of someone's spouse (Obama)? Needless to say, the back and forth between the two campaigns has confused the debate to the point that it is hard to know, let alone understand, what is true or false about the welfare changes proposed by the administration. Moreover, it remains unclear whether such changes will give the kind of flexibility to the states Gov. Romney called for in 2005, or if this whole issue just another trip down the political rabbit hole. What a sad commentary — and what a lost opportunity for those on welfare who define the word "work" as getting a job.